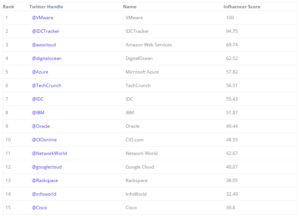 BIG DATA AND CLOUD 2017: ORACLE IN THE TOP 15 OF THE INFLUENCERS! Also this year, Onalytica has announced the results of its research on the world’s major influencers of 2017 in the field of ICT, intended both as individuals and as companies. Oracle, of which Alfa Sistemi is Platinum Partner, is inside the top 15 both in the “Big Data Analysis” segment (12th position) and in “Cloud Computing” (9th position). 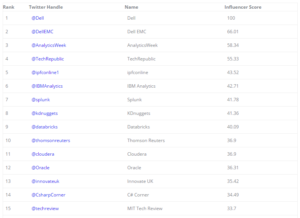 Onalytica, a company based in London and New York, has developed a particular software (IRM- Influencer Relationship Management) for detecting influencers, granting a secure, transparent data analysis, not influenced by any sponsorship. In this way it has managed also this year to build a ranking of the Top 100 Influencers and Brands, where the relationships between people and businesses are highlighted, also through a graphical representation. Oracle, which is very well positioned, is one of the companies on the international scene that is best equipped to exploit technology to create new business models, innovate products, services and processes.